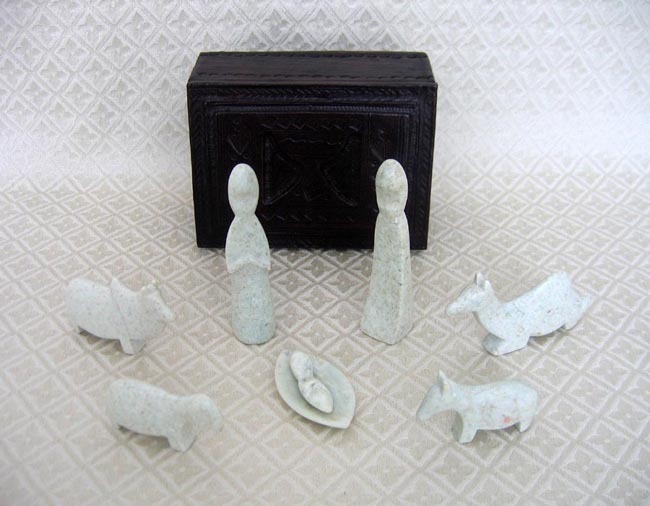 This Nativity is hand-carved from a soapstone called wonder stone. The stone is relatively soft and suitable for shaping with friction. The Nativity includes the Holy Family, a camel, a donkey, a zebu cattle with hump, and a sheep. The standing figures measure 4 inches tall. The set comes in a hand-tooled leather box with decorative emblems in it. The box measures 6 inches wide by 2.5 inches high by 4.25 inches deep. Tuareg artisans in Agadez, Niger use this soapstone to carve this Nativity. Artisans work outside all day and then lock their wares in a metal box at night. Because theft is so prevalent, someone guards the metal box all night to ensure the goods are not stolen. The Tuareg people are predominently nomadic people of the sahara desert, mostly in the Northern reaches of Mali near Timbuktu and Kidal. The Tuareg are often referred to as “Blue Men of the desert” because their robes are dyed indigo blue. They live in small tribes with between 30 and 100 family members and keep camels, goats, cattle and chicken which graze the land. They are a proud race of people, famous for their fighting abilities and artwork. The Tuareg are known for their silversmithing. Roaming the desert in camel caravans, the Tuareg craft the same distinct designs in silver as their ancestors, the Berbers. Each Tuareg subclan has their own cross, and each cross has its own pattern that indicates their particular nomadic route. The sword is a Tuareg’s most valued possession. Many are passed from generation to generation and said to be protected by the victories of its past owners. Tuareg women process milk, make butter, prepare animal skins, make clothes and bedding from skin, collect firewood and water. Men drive the animals and take responsibility for selling. Men will take camels to towns to sell them, returning with millet which they use as flour for bread making. Other purchases will include sugar and tea. Most outputs, however, are consumed by the family. In recent times the Tuareg have been abandoning their nomadic way of life and taking up sedentary lifestyles through urbanization and resettlement. Drought and government policy are threatening their traditional way of life, but Tuaregs and their camel-caravans still appear unexpectedly on the horizon before melting into the desert again.